Although it’s a few miles to the actual open moorland, Ashburton calls itself “Gateway to the Moor”. This title relates to the close ties that existed between the town and Dartmoor, ties that in our modern age seem less important, largely forgotten. For many residents now, the fact that we sit on the A38, just a short drive from Exeter or Plymouth, is far more relevant than our proximity to the granite hills to our north. Friends of Ashburton Library have teamed up with Dartmoor National Park to run a couple of events that bring to life Dartmoor’s importance to Ashburton over the centuries. On Sunday, September 18th, the Town Tales and Trails event takes families on a trail of stories, music and other adventures around town. 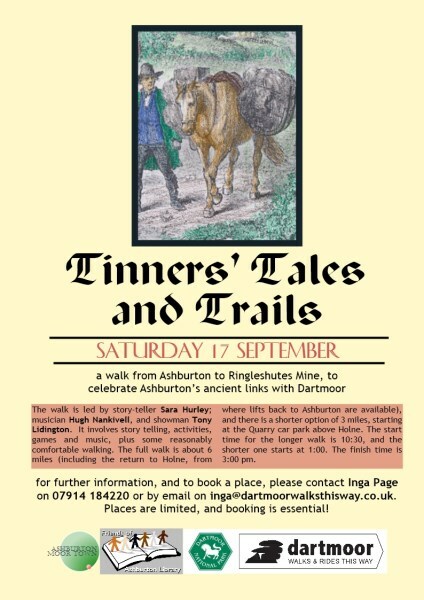 On Saturday, September 17th, I will be leading a walk from Ashburton to the Ringleshutes Tin Mine above Holne, following the old packhorse track that wound its way from Ashburton all the way to Tavistock. Joining the walk are storyteller Sara Hurley, musician Hugh Nankivell and showman Tony Lidington who will involve the walkers in songs, stories, and quizzes relating to the landscape we pass through and its rich history. This track would have been used in the past by tinminers bringing their tin ingots into town, by long packhorse trails bringing wool from moorland farms and by townspeople in the summer heading out to pick whortleberries in the gullies of the disused mine. The full walk starts at 11 am a little way outside Ashburton and involves some steady uphill walking, mostly on footpaths but some on country lanes. We walk out to Ringleshutes mine, then return together to Holne where people can enjoy a cup of tea in the Community Tea Rooms, around 3.30 pm onwards This walk is a total of 6.5 miles. From here, people can either walk back down to the start point (a further 2 miles) or can get a lift back down from a FOAL volunteer. The shorter walk starts at a car park just above Holne around 1 pm and involves walking out to the tin mine and back, a distance of 3 miles on fairly level ground (gentle uphill gradients) and good paths. These walkers can also go to the tea rooms after the walk, or go straight back down to Ashburton. Because of limited parking spaces, we will encourage people to car share to this starting point. 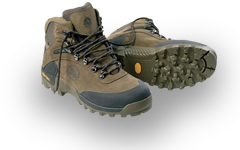 Booking is essential for both the longer and shorter walks as numbers are limited. At the time of booking, transport arrangements can be clarified. 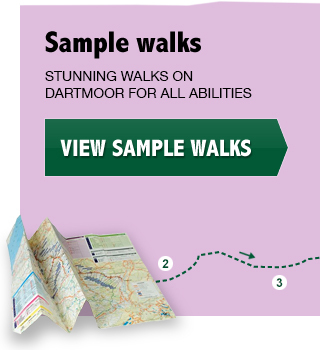 There is no cost for this walk thanks to the generous support of Dartmoor National Park and Friends of Ashburton Library. Email [email protected] to book.